From sunny Venetian concertos by Vivaldi to searching devotional works by Bach, the Baroque era presents a rich and varied musical landscape. 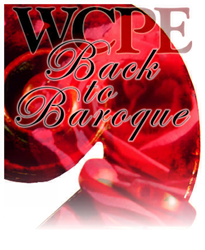 TheClassicalStation.org announces today a “Back to Baroque” Weekend, April 22, 23, 2017. Music Director William Woltz programs a weekend which highlights the language of music that came to be defined as the music we know today. In addition to all this wonderful programming, you can program your favorite Baroque music. The Saturday Evening Request Program 6 to midnight plays your requests. Go to SERP and be a radio programmer for an evening! WCPE’s live broadcast of Great Classical Music, 24 Hours A Day can be accessed around the globe in several ways: on-line streaming in multiple formats, including IPv6; local cable television systems; and traditional radio broadcasting. A complete list of the ways WCPE is available with instructions for cable and satellite reception can be found at theclassicalstation.org/listen.shtml. WCPE broadcasts on a variety of FM frequencies in Eastern North Carolina and is heard throughout Eastern and Central North Carolina and Southern Virginia from its transmitting tower in Wake Forest, NC and other repeater stations. A live feed is also available on the Internet at http://www.theclassicalstation.org, cable systems, affiliate radio stations and via satellite. WCPE is a non-commercial, listener-supported station that plays classical music exclusively. WCPE is owned and operated by the Educational Information Corporation, a North Carolina non-profit broadcasting organization. The Corporation was formed in 1973 and began operating WCPE in July of 1978. The Corporation holds a federal 501 (C) (3) Public Charity Exemption Certificate and the corresponding certificate from the State of North Carolina.